Presents an accessible account of flesh and bones of surgery. This title covers all the key concepts med students need with no gaps. It can be used either as an introduction to a topic, or as a revision aid. It depicts difficult concepts using cartoon-strip illustrations, which enable rapid understanding and assimilation of information. 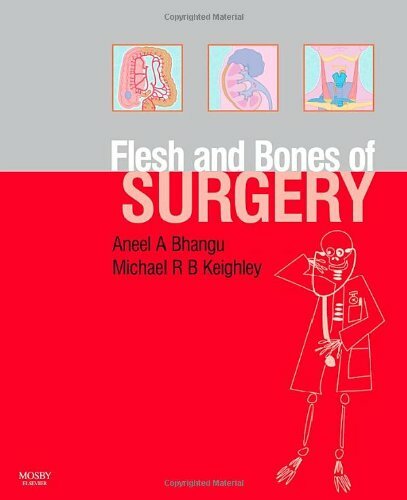 The Flesh and Bones of Surgery presents a concise and accessible account of this key subject in the undergraduate medical curriculum. It covers all the key concepts medical students need with no gaps. It can be used either as an introduction to a topic, or as a revision aid. In Section 1, The Big Picture overview gives a descriptive overview of a subject in 8pp. In the High Return section, 50 fundamental principles underlying a subject are set out. These 50 principles are expanded into double-page spreads in the 'Fleshed Out' section where double-page explanations of the key principles clearly convey what medical students need to know. Difficult concepts are depicted by cartoon-strip style illustrations, which enable rapid understanding and assimilation of information. Big Picture Section - enables readers to relate detail to the subject as a whole High Return Facts - prevents students from having large gaps in their knowledge. Can be used as a revision tool. Reinforces the major points Cartoon-strip illustrations - enable students to visualize difficult concepts in a step-by-step format. Allow information to be chunked into student-friendly sizes. Double-page overviews - students can read summary of topic without cross-referencing to other pages. All laid out on one spread.